The Carpet Snake Dreaming story was passed on to Billy Stockman Tjapaltjarri. 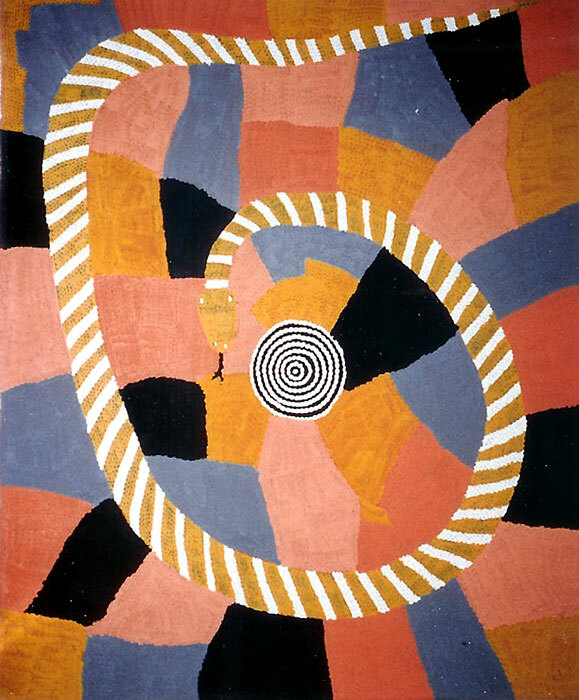 The painting depicts the carpet snake hunting in the spiky, spinifex grass which grows in abundance on the desert earth near Napperby, Mt Denison in Central Australia. The striped body paint design of the snake indicates it is painted up for ceremony. As custodian of the totem, Billy had cultural responsibility to look after the carpet snake to ensure its survival in the environment. Billy Stockman Tjapaltjarri was born near Mt Denison, north-west of Papunya, c.1927 of the Anmatyerre/Western Arrente language groups. His first contact with non-Indigenous people was as an infant survivor of the Coniston massacre (1928). Billy was brought up as an adopted brother by Clifford POSSUM TJAPALTJARRI (c.1932-2002). The brothers were both founding members of the original Papunya painting group, assisting to paint the Honey Ant Dreaming design on the school wall which is recognised as the genesis of the desert art painting movement in the early 1970s. Billy Stockman Tjapaltjarri is ranked amongst one of the most important Australian Indigenous Artists.